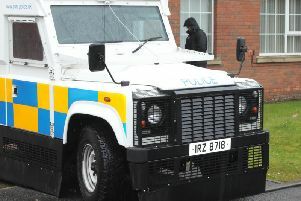 A woman jointly charged with murdering a Co Armagh man told police she played no part in the fatal attack and claimed she “grabbed” a knife from her co-accused in the midst of the assault, a court has heard. Stephen Thomas Hughes, 29, and 25-year old Shaunean Boyle have been jointly charged with murdering Lurgan man Owen Creaney in July 2014. Mr Creaney was assaulted in the hallway of Hughes’s Moyraverty Court home in the early hours of July 3, 2014. It took him two days to die from the injuries he sustained in the beating, then his body was dumped into a green recycling bin. Both accused have admitted being present during the attack, but have both denied murder and have blamed each other for the violence which claimed the 40-year-old’s life. As the murder trial at Belfast Crown Court entered its third week, the jury heard transcripts of police interviews conducted with Boyle following her arrest on Saturday July 5, 2014. During her first interview, the mother of one from Edenderry Park in Banbridge refused to answer a majority of questions and gave a largely ‘no comment’ response – but a pre-prepared statement was handed to the PSNI. In the statement, Boyle claims that she played no part in the attack on ‘Fonzie’, and that while she helped to clean blood from his face in the aftermath of the assault and helped to shower him, she was not involved in a clean-up operation afterwards, or placing his remains in a recycling bin after he passed away from his injuries. Boyle, in her statement, said she “did not assault Fonzie in any way”. She said: “I tried to stop Stephen Hughes from hitting Fonzie, but every time I did try to stop Stephen, he pushed me away. Each time he pushed me I kept trying to stop him. It is Boyle’s version of events that following the attack in the hallway, she washed blood from Mr Creaney’s face and also from the lino. She said that after the attack, both she and Hughes got Mr Creaney to his feet and brought him up the stairs. She said she placed a cushion under his head, while Hughes placed a blanket over him. Boyle claimed that during this process Mr Creaney was “mumbling”, but said that was something he did when he was drunk. She said she also “asked him to squeeze my hand to make sure he was ok. I got him water ... he was mumbling and moving his hand”. In the statement, Boyle also claimed that some time between the assault and Mr Creaney dying, he “peed himself”, and that she and Hughes showered him then dressed him in some of Hughes’s clothing. She said that when she left the house on Thursday morning, she thought Fonzie was ok, that in the past she had known her friend to “sleep for days” and that she didn’t think he was badly injured. Boyle also told police that when she returned to Moyraverty Court the following afternoon, Mr Creaney was “sleeping and still mumbling”, that she checked on him between 20 and 30 times, and that she brought him water and juice. The jury has already heard that Mr Creaney died as a result of blunt force trauma to both his chest and head. His injuries included a total of 15 fractured ribs and a broken breastbone, as well as bleeding of and tearing to the brain.